If two teams are tied then the winner will be decided from head to head competition. If ties still exist, then run deferential between runs allowed and runs score will be used. The team that is playing at their home field is the home team. GAME BALL: Each team shall provide 3 game balls to the umpires at each game. SCOREBOOK: Each team is responsible for keeping an accurate scorebook SUBMITTING SCORES: Winning coach is responsible to submit the score by through their respective team’s Coaches Dugout. Questions? Contact Vince Brown @ 714-458-9321. GAME FORMAT: Games are 7 innings. 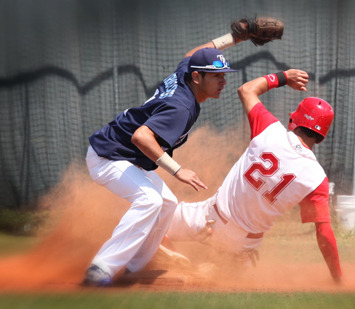 Tournament has NO MERCY RULE unless coaches mutually agree before the start of the game. CHANGES / ADJUSTMENTS: Please make sure you communicate with any changes or adjustments in your schedule to Vince Brown @ 714-458-9321. Schools outside of Orange County, your area assigners will have received a schedule from the OCassigner or the tournament director, HOWEVER . . . PLEASE DOUBLE CHECK AND MAKE SURE YOUR ASSIGNER HAS YOUR HOME GAMES SCHEDULE. GOOD LUCK!